AdSense – for many wanting to monetize their websites Google AdSense is the key. And why shouldn’t it be? 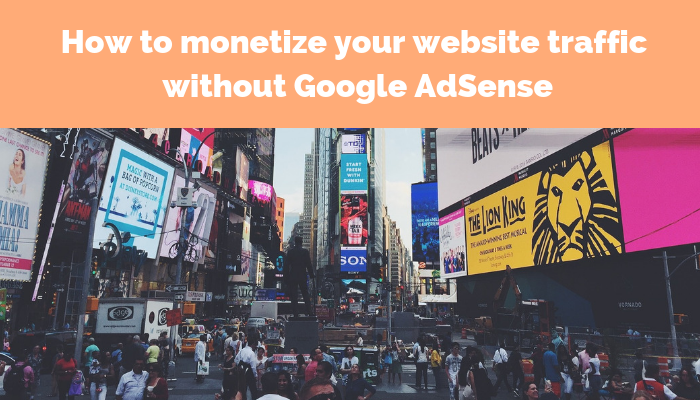 After all, Google is a huge company, they pay on time, AdSense is easy to use for both advertiser and publisher and they make sure all ads are as relevant to your site/user as possible. However, for many people, they aren’t either an optimal or a valid choice. In all its glory, AdSense puts many boundaries on what sites they accept which leaves many people with no easy way to monetize their traffic. Luckily, nature hates a vacuum. There is a great number of alternative ways to monetize your website’s traffic. But first, let’s talk a bit more about why people need or may want an alternative in the first place. Why and when an alternative to Google AdSense is needed? Many website owners can’t use the bountiful AdSense network because their website topic is on the prohibited list. The regulations that AdSense enforces are quite strict and the number of prohibited topics and industries is quite long. Even though you may have, let’s say, a flourishing blog about tobacco products (see, nothing illegal there!) you won’t be able to monetize your traffic through Google AdSense just because they don’t accept such websites in their systems. Some people also find their business damaged by AdSense. This is a very specific situation when your website is, for example, a well-known company blog that is considered a premium source of content of industry-specific topics. However, AdSense, through their relevant ads, drives some of your revenue away from you right to your main competitors. After all, their ads are the most relevant for your site. Luckily, there are some alternative ways of website traffic monetization that won’t damage your own conversion rate. If you want everything that AdSense offers but for any reason can’t advertise through Google’s product, Media.net may be the perfect choice for you. It is basically an AdSense but for Bing and Yahoo contextual ads. While some traffic tests show that the payments are a bit lower in the case of Media.net, there are still better than in the case of many AdSense alternatives. Plus, you may add another tool that will cover the Google contextual ads in place of AdSense. Another choice is to go straight into affiliate networks market. Many of them work as good as AdSense does but offer a bigger variety of accepted topics and faster integration process. In its most basic sense affiliate marketing depends on you, a website owner, choosing one of the products you wish to advertise from the network’s portfolio. You advertise that product – it may be a website, an online store or a service. You will get paid when the lead your website generated converted. There are of course many different models. Usually the longer the user flow, the harder it is to convert the user but the payment for you (the publisher) is also much higher. Among the shortest and least paid (per user) you can find models such as CPC (Cost-per-click) and CPM (Cost-per-mille) and the higher tier models include CPS (cost-per-sale) where an advertiser pays only when the customer made a successful purchase or more specialized models like CPI (Cost-per-install) very popular among the mobile apps developers. Also, remember that the better your traffic is the more you can earn. If you want more tips you may want to check out one of our past articles boosting your website traffic. Now, which affiliate network should you use? It all depends on the type of “product” they offer. If you have a blog about professional poker, you may want to find an affiliate network that specializes in online gambling ads. On the other hand, you may choose a network by other characteristics, for example, VigLink is a great network for text link monetization, whereas ClickFunnels specializes in designing the complete sale funnels. They also offer a very interesting thing, which is the sticky cookies. Usually, if the customer clicks through your ad but won’t convert through that session you won’t get anything even if they later come back to the target website and do make a purchase. Sticky cookie remains in the user’s cache and will affiliate the positive conversion with your site even when the user makes a purchase in a separate session, for a different product or in couple days after the initial clickthrough. Luckily, more and more affiliate networks and plugins introduce such means of tracking. There are many more ways to monetize your website other than AdSense or affiliate marketing. For example, if your website is a popular blog you may want to consider writing sponsored blog posts or guest posting. The rates usually aren’t fixed and depend on individual deals with companies that want to use your traffic. The pros of this method of monetization are that you get to choose a topic/product/service that usually lines perfectly with your website’s theme and will be interesting to your regular visitors. On the other hand, it requires much more time and work on your side. If you don’t have problems with putting more work into your website content try premium content strategy. Offer everything you offer right now for free, as it is, but add even better content behind some form of the payment wall. I would personally opt for a subscription model because that’s the economy in which we currently live in and to which most internet users are accustomed. The content may be exclusive data from your personal market research, a webinar or podcast. Whatever suits your (and your audience) taste. Also, the lack of ads for premium users is sometimes a good incentive. Now, what if you don’t want to put so much work into your website but still want to live off it? If you don’t like the idea of placing ads on your meticulously designed website or you feel that they will interfere into the user experience too much, you may want to choose to add an intermediate page. Basically, the user entering your website will be greeted first with an intermediate page on which all the ads are placed and then he or she continues to your clean, ad-free website. Depending on your audience and geo this can bring a surprising amount of money. If you are interested, please check out Shore.st website monetization tools, as this is one of the fields in which we specialize in. Other, rather effortless (on your side) ad format is pop-ads. Basically, the ad will be displayed as a pop-up at your website. Many people find them very irritating but, on the other hand, if your traffic does not consist of many returning visitors they may prove to be a quick and good way of traffic monetization. Experiment with ad formats! Test your traffic! There are countless methods of monetizing your website traffic other then what we discussed above. However, these are the most popular and usually most profitable. Still, remember to always test your traffic. There is always a chance that your audience will respond better to a niche method of monetization. So, if you only have time, resources and means to experiment be sure to do that once in a while. Who knows? Maybe you’ll be the first to find a new sweet spot.